Seven members of the D.C. Council and Attorney General Karl Racine want the National Park Service to remove a statute of a Confederate general from a parklet near the police department. WASHINGTON — Eight D.C. elected officials have asked the National Park Service to remove a statute of a Confederate general from a parklet near Judiciary Square saying it commemorates an ideology with no place in the nation’s capital. The letter from Councilmember David Grosso says that Albert Pike supported slavery and served as a brigadier general for the Confederate Army during the Civil War. “We in the District of Columbia hold dear the values of equality, diversity and inclusion, which are in direct conflict with the values embodied by the statue of Albert Pike,” the letter states. “In a time when these values are under constant attack by white supremacists, neo-Nazis, and far-right terrorists, the presence of a statue honoring Albert Pike only serves to perpetuate and incite hate, violence and oppression,” the letter continues. D.C. Attorney General Karl Racine plus Council members Anita Bonds, Kenyan McDuffie, Charles Allen, Brianne Nadeau, Elissa Silverman and Robert White co-signed the letter, which comes amid a growing chorus of public officials across the country seeking to strip public parks and property of emblems of the nation’s Confederate and slaveholding past. The statue sits on a patch of federal property adjacent to the Metropolitan Police Department headquarters on Indiana Avenue and 3rd Street. 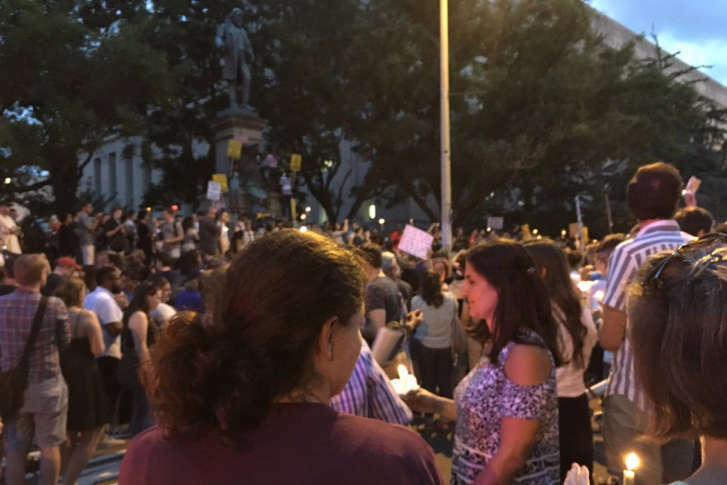 It was the scene of a demonstration Sunday evening to show solidarity with the victims of the weekend violence in Charlottesville. Overnight, Baltimore removed several such statues from city property. And Maryland state officials are considering removal a statue of Supreme Court Justice Roger Taney, who penned the 1857 Dred Scott decision upholding slavery. The statue was erected in 1900 by the Freemasons. Originally from Boston, Pike moved to D.C. after the Civil War and was active in the Freemasons here, according to Washington Evening Star archives.